Finishing off your look with a hat is a fabulous way to add a unique touch of style and distinction. 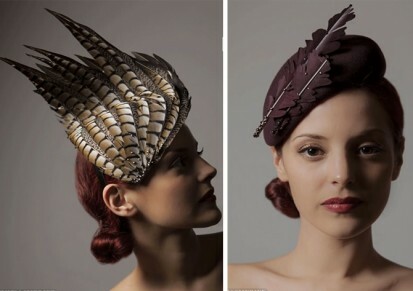 When the mood strikes or the occasion calls for it, perhaps whilst attending a wedding, horse race or other dressy event, there are some gorgeous designs to gravitate to in choosing a hat or headpiece which is also called ‘fascinator’. One such milliner who creates beautiful pieces to adorn your crown is making quite a name for herself: Designer, Vivien Sheriff. Located in the heart of the English Countryside is Vivien Sheriff’s Studio. The landscape, wildlife and natural breath-taking beauty that surrounds inspires the dedicated team of the finest hat makers. Mindful of these surroundings beauty the company has also consistently striven to source ethical materials. The designers at this high-end British manufacturer embodies English heritage and traditional millinery processes, working by hand with fine quality natural materials to produce these elegant hats created with a distinct style. Vivienne Sheriff’s headpieces have graced the head of royalty. Their look is iconic, instantly recognizable, stamped on each stunning and unique creation.